Everybody suffers from a spot or pimple outbreak at some point in their life. However, the term "acne" refers to recurrent suffering from blackheads, whiteheads, and cystic spots. Acne usually starts in puberty, occurs in both sexes, and can last for five to 10 years. However, about 20% of all cases occur in adults in their twenties and thirties. It also tends to be worse in people with oily skin. You can get acne anywhere on your body. However, it's commonly found on the face, neck, chest, back, shoulders, upper arms, or all of the above. 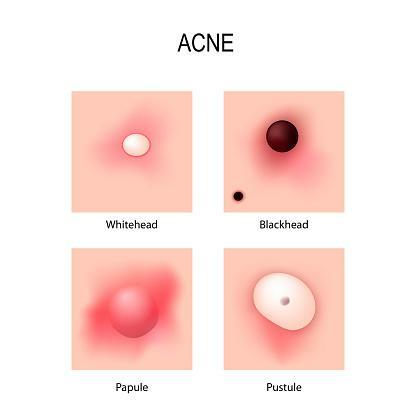 Acne can cause both blackheads and whiteheads, known as comedones. Blackheads are essentially small, flat spots with black centers (hence their name). 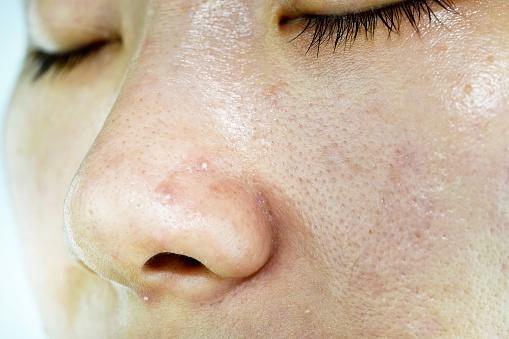 They occur when your pore openings are large and become clogged. Their dark appearance is down to how they open at the surface of your skin and react with oxygen in the air. Squeezing a blackhead will push out the dried oil and skin cells that are blocking the pore to eliminate its appearance; however, it can lead to infection and scarring, so this is not generally recommended. On the other hand, whiteheads are small, flesh-colored bumps. If you have smaller pore openings and they become clogged, whiteheads will occur just under the surface of the skin, which is why they have a white appearance. Like with blackheads, it's better to leave whiteheads to go away on their own. However, if you want to take matters into your own hands, there are a number of home remedies and products you can use to speed up healing. Cysts are the most severe type of acne. They are found beneath the skin and contain pus that is usually extremely painful and sensitive to touch. Nodules can develop from cystic acne, which are solid, firm swellings that can easily become inflamed and infected. If you have nodules, your skin must be treated with the utmost care and attention. Papules - These are small, red bumps that are raised on the skin. They are often inflamed caused by infected hair follicles. 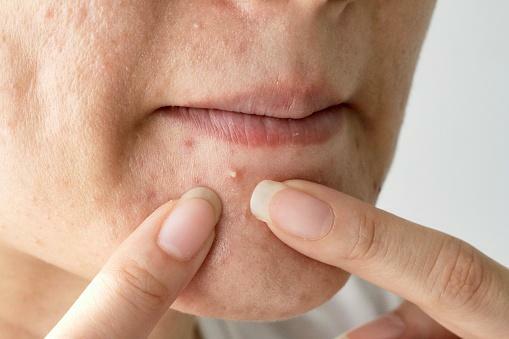 Pustules - Like papules, these are small, red pimples. However, the key difference is that pustules have pus at their tips, which is how they obtained their name. Papules and pustules occur when the pores get so irritated that their walls break, thus resulting in bigger pimples. 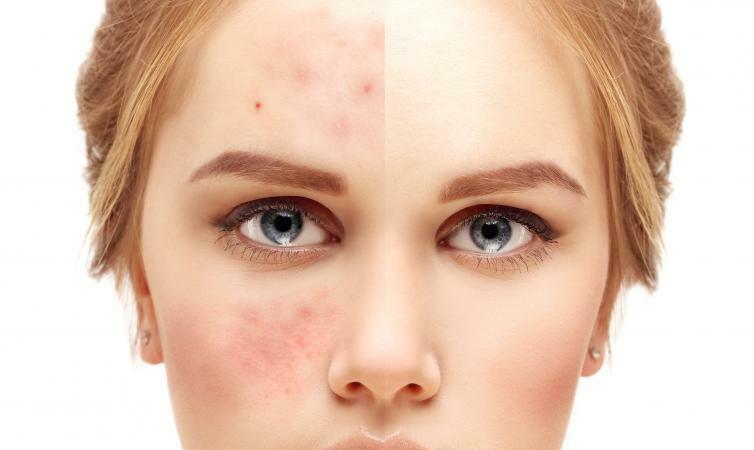 Both of these types of acne are inflammatory and are therefore more likely to cause scarring, so you need to make sure that you're keeping your skin clean and looking after it on a daily basis. 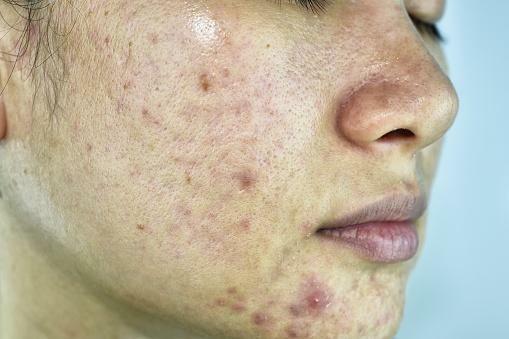 Acne is the most common skin condition in the United States, according to the American Academy of Dermatology. It occurs when the skin gets too greasy and natural secretions from its sebaceous (oil) glands block the tiny openings for hair follicles, resulting in lumps and bumps on the surface area. This is known as having "plugged", "blocked", or "clogged" pores. Oil, bacteria, dirt, and dead skin cells can also cause plugged pores. The reason why acne tends to begin at puberty is because hormones stimulate the sebaceous glands to make more oil as the body begins to mature and develop. Pores are vulnerable to becoming clogged if there is too much sebum and too many dead skin cells. Bacteria can then get trapped inside the skin's surface and multiply. Although acne is more likely to occur in people with oily skin, it's a very common condition caused by a number of different factors. Even though it's sometimes tempting, try to resist touching or squeezing your spots or pimples. There are many effective treatments for acne that reduce the redness in your skin, alleviate pain and soreness, and unblock your pores. If you're experiencing low self-esteem from severe acne, don't be afraid to visit your dermatologist or other healthcare provider who will come up with an effective treatment plan for your specific case. Essentially, if you treat your acne with care and attention, you can easily help your skin to obtain a smoother and clearer appearance.